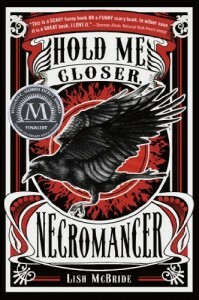 In Hold Me Closer, Necromancer, Sam LaCroix is a college drop-out with a dead-end job at a burger joint. He just coasts along, hanging out with his friends/coworkers Ramon, Brooke and Frank, never quite satisfied with his lot in life, but not exactly unhappy, either. That all changes one night when he accidentally smashes the headlight of a sports car while playing potato hockey behind the restaurant. It turns out the owner of the car, Douglas, is a dangerous man with a chip on his shoulder, and when he comes into the restaurant to complain about the smashed headlight, he sees something in Sam that puts him directly in Douglas’ crosshairs. Apparently Sam has been hiding in plain sight his whole life, but Douglas is suddenly able to sense his powers and demands to know what he is doing in Seattle. Sam blows him off, but finds out very quickly that this is a huge mistake. First, Sam is attacked by one of Douglas’ henchmen, a man who somehow manages to slice up Sam’s back without using a weapon. Sam makes it out of the encounter alive, but Douglas isn’t done with him. The next morning Sam wakes up to discover his friend Brooke’s decapitated head in a box… and then she talks, and explains that she was sent as a message. Things only get weirder and more dangerous for Sam and his friends after that. For whatever reason, this book took me a long time to finish. I started it about a month ago, but put it down for weeks before finally plowing my way through most of it in one sitting. I ended up enjoying it overall, but there were definitely a few plot holes and strange choices throughout that didn’t bother me while I was reading but felt a bit more problematic once I finished and let the book sink in. First off, the book jumps back and forth between first person and third person. The first person scenes are told from Sam’s point of view, and take up most of the book, but the third person scenes are both longer and more common than I was expecting. There are several scenes from Douglas’ perspective as well as some from a girl named Brid whose connection to Sam’s storyline isn’t immediately apparent. These scenes do eventually come together with the main storyline, but in retrospect I think part of what bogged me down for so long was getting stuck in one of those third-person scenes without understanding its purpose. Also, Douglas’ motivations don’t entirely makes sense. He tells Sam that he needs training and can either die or be his apprentice, but never even tries to gain Sam’s confidence. It’s clear to both Sam and the reader that Douglas only means him harm from the outset, so there’s never really any danger that Sam might be tempted towards the dark side. It’s kind of a shame, really, because if Sam had been presented with more of a moral quandary, it might have ramped up the tension a bit. That said, I enjoyed the book enough that I immediately bought the sequel when I was done. I like McBride’s writing style, and I enjoyed the setting and characters. I’m curious to know what happens next, even if this book started unravelling a bit after I let it sink in. I think there’s a decent chance this is a series that will actually improve as it goes on despite my criticisms of the first book. Worth a read.